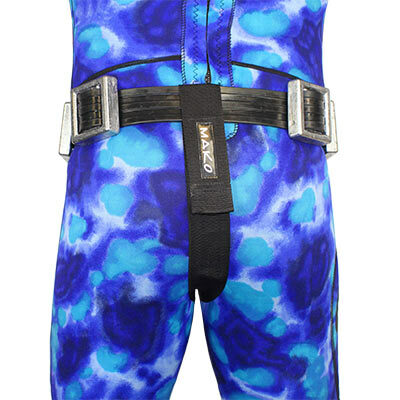 The MAKO Spearguns Weight Belt Crotch Strap keeps your weights in place (positioned low around the hips) and prevents your weight belt from sliding towards your torso when you are upside down during descents. The Weight Belt Crotch Strap works with any Marseilles style belts. Includes a heavy duty mono loop which when connected to the Marseilles buckle pin, maintains the same, highly desired, quick release safety feature, made famous by the Marseilles style belts. Since slimming down my waistline, my weight belt tended to slide up when inverted...not anymore. And I like that it's still quick release with the pin style belt buckle. Be warned that this won't work with the plastic style non-freediving belt buckles. It's funny how something so simple and inexpensive can make such a difference for you. My weight belt was constantly sliding up around my stomach while diving and would also turn and be in the wrong position when it did. Nothing worse than going for air after a long dive and having a weight belt right around your belly restricting you, totally uncomfortable and a pain to keep repositioning. This allows me to have my belt a little bit looser to so its always comfortable and I never have to touch it once the whole time I'm in the water. Funny enough, it's one of my favorite pieces of gear.